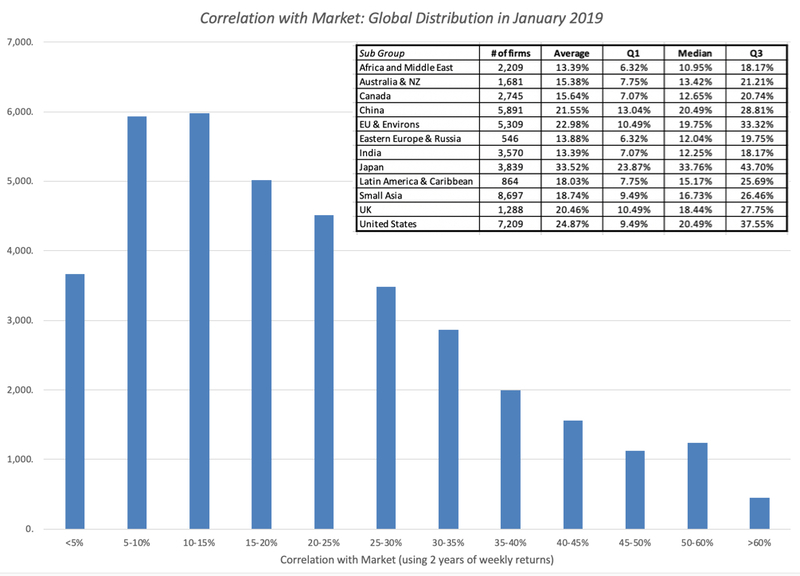 Musings on Markets: January 2019 Data Update 4: The Many Faces of Risk! I think that all investors would buy into the precept that investing in equities comes with risk, but that is where the consensus seems to end. Everything else about risk is contested, starting with whether it is a good or a bad, whether it should be sought out or avoided, and how it should be measured. It is therefore with trepidation that I approach this post, knowing fully well that I will be saying things about risk that you strongly disagree with, but it is worth the debate. I. Risk falls on a continuum: Risk is not an on-off switch, where some assets are risky and others are not. Instead, it is better to think of it on a continuum, with investments with very little or close to no risk at one extreme (riskless) to extraordinarily risky investments at the other. That if the government delivers it's promised coupon we are made whole again, also not true since inflation can be a wild card, rendering the real return on a government bond negative, in some periods. A nominal risk free rate is not a real risk free rate, which is one reason that I track the inflation indexed treasury bond (TIPs) in conjunction with the conventional US treasury bond; the yield on the former is closer to a real risk free rate, if you assume the US treasury has no default risk. If there is one lesson that emerged from the 2008 crisis, it is that there are some periods in market history where there are truly no absolutely safe havens left and investors have to settle for the least stomach churning alternative that they can find, during these crises. 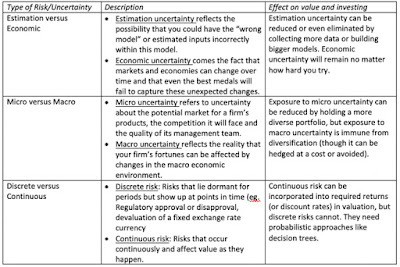 Note that some of these risks are more difficult to estimate and deal with than others, but that does not mean that you can avoid them or not deal with them. In fact, as I have argued repeatedly, your best investment opportunities may be where it is darkest. III. For investors, risk standing alone can be different from risk added to a portfolio: This is perhaps the most controversial divide in finance, but I will dive right in. The risk of an investment can be different, if it is assessed as a stand-alone investment, as opposed to being part of a portfolio of investments and the reason is simple. Some of the risks that we listed in the table above, to the extent that they are specific to the firm, and can cut in either direction (be positive or negative surprises) will average out across a portfolio. It is simply the law of large numbers at work. 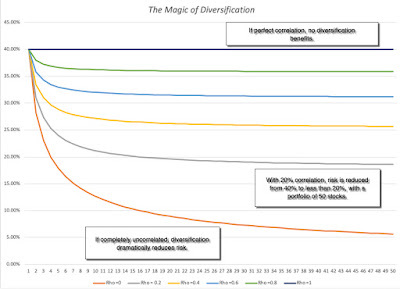 In the graph below, I present a simplistic version of diversification at play, by looking at how the standard deviation of returns in a portfolio changes, as the number of investments in it goes up, in a world where the typical investment has a standard deviation of 40%, and for varying correlations across investments. If the assets are uncorrelated, the standard deviation of the portfolio drops to just above 5%, but note that the benefits persist as long as the assets in your portfolio are not perfectly positively correlated, which is good news since stocks are usually positively correlated with each other. Furthermore, the greatest savings occur with the first few stocks that are added on, with about 80% of the benefits accruing by the time you get to a dozen stocks, if they are not all in the same sector or share the same characteristics (in which case the correlation across those stocks will be higher, and the benefit lower). I know that I am now opening up an age old debate in investing as to whether it is better to have a concentrated portfolio or a diversified one. Rather than argue that one side is right and the other wrong, I will posit that it depends upon how certain you feel about your investment thesis, i.e., that your estimate of value is right and that the market price will correct to that value, with more certainty associated with less diversification. Speaking for myself, I am always uncertain about whether the value that I have estimated is right and even more so about whether the market will come around to my point of view, which also means that it is best for me to spread my bets. You can be a value investor and be diversified at the same time. IV. 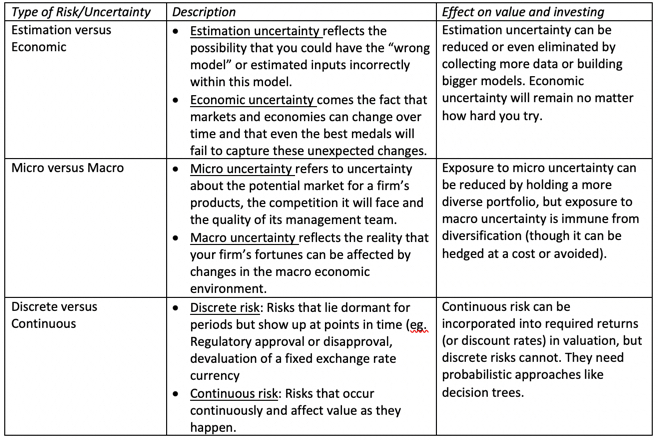 Your risk measurement will depend on how and why you invest and your time horizon: Broadly speaking, there are three groups of metrics that you can use to measure the risk in an investment. Price Measures: If an asset/investment is traded, the first set of metrics drawn on the price path and what you can extract from that path as a measure of risk. There are many in investing who bemoan the Markowitz revolution and the rise of modern finance, but one of the byproducts of modern portfolio theory is that price-based measures of risk dominate the risk measurement landscape. Earnings/Cashflow Measures: There are many investors who believe that it is uncertainty about earnings and cash flows that are a true measure of risk. While their argument is that value is driven by earnings and cash flows, not stock price movements, their case is weakened by the fact that (a) earnings are measured by accountants, who tend to smooth out variations in earnings over time and (b) even when earnings are measured right, they are measured, at the most, four times a year, for companies that have quarterly reporting, and less often, for firms that report only annually or semi-annually. Risk Proxies: Some investors measure the risk of an asset, by looking at the grouping it belongs to, arguing that some groupings are more risky than others. For instance, in the four decades since technology stocks became part of the market landscape, "tech" has become a stand in for both high growth and high risk. Similarly, there is the perception that small companies are riskier than larger companies, and that the market capitalization, or level of revenues, should be a good proxy for the risk of a company. While I will report on each of these three groups of risk measures in this post, you can decide which measure best fits you, as an investor, given your investment philosophy. The most widely accessible measures of risk come from the market, for publicly traded assets, where trading generate prices that change with each trade. 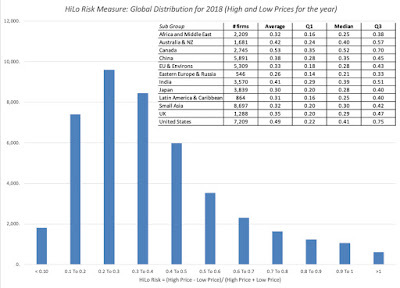 That price data is then used to extract risk measures, ranging from intuitive ones (high to low ranges) to statistical measures (such as standard deviation and covariance). When looking at a stock's current price, it is natural to also look at where it stands relative to that stock's own history, which is one reason most stock tables report high and low prices over a period (the most recent 12 months, for instance). While technical analysts use these high/low prices to determine whether a stock is breaking out or breaking down, these prices can also be used as a rough proxy for risk. Put simply, riskier stocks will trade with a wider range of prices than safer stocks. Based upon this measure, stock A is riskier than stock B.
Embedded in the distribution is the variation of this measure across regions, with some, at first sight, counterintuitive results. The US, Canada and Australia seem to be riskier than most emerging market regions, but that says more about the risk measure than it does about companies in these countries, as we will argue in the next section. If you want to see these risk measures on a country basis, try this link. 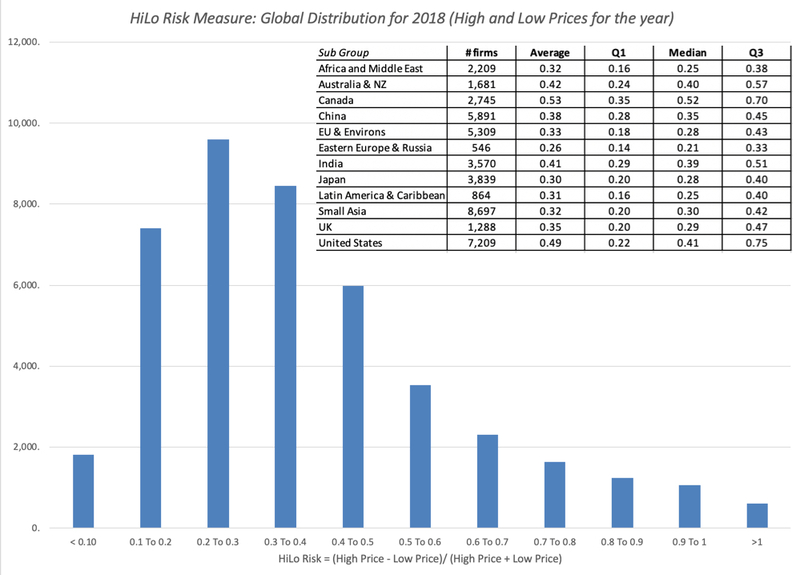 The high/low risk measure is simple to compute and requires minimal data, since all you need is the high price and the low price for the year. It is even intuitive, especially if you track market prices continuously. It does come with two problems. The first is the flip side of its minimal data usage, insofar as it throws away all data other than the high and the low price. The second is a more general problem with any price based risk measure, which is that for the price to move, there has to be trading, and markets that are liquid will therefore see more price movements, especially over shorter time period, than markets that are not. It is therefore not surprising that US stocks look riskier than African stocks, simply because liquidity is greater in the US. So, why bother? If you are comparing stocks within the same liquidity bucket, say the S&P 500, the high-low risk measure may correlate well with the true risk of the company. However, if your comparisons require you to look across stocks with different liquidity, and especially so if some are traded in small, emerging markets, you should use this or any other price-based measure with caution. If you have data on stock prices over a period, it would be statistical malpractice not to compute a standard deviation in these prices over time. Those standard deviations are a measure, albeit incomplete and imperfect, of how much price volatility you would have faced as an investor, with the intuitive follow up that safer stocks should be less volatile. 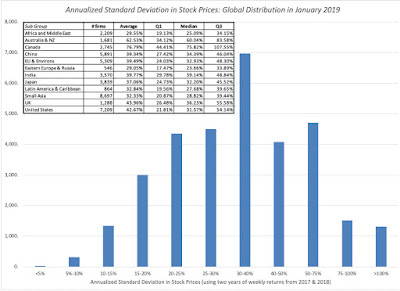 As with the HiLo risk measure, computing a standard deviation in stock prices, without adjusting for price levels, would yield the unsurprising conclusion that higher prices stocks have higher standard deviations. With this measure, the scaling adjustment becomes a simpler one, since using percentage price changes, instead of prices themselves, should level the playing field. In fact, if you wanted a fully integrated measure of returns, you should also include dividends in the periods where you receive them. However, since dividends get paid, at most, once every quarter, analysts who use daily or weekly returns often ignore them. To compute and compare standard deviations in stock returns across companies, I have to make some estimation judgments first, starting with the time period that I plan to look over to compute the standard deviation and the return intervals (daily, weekly, monthly) over that period. 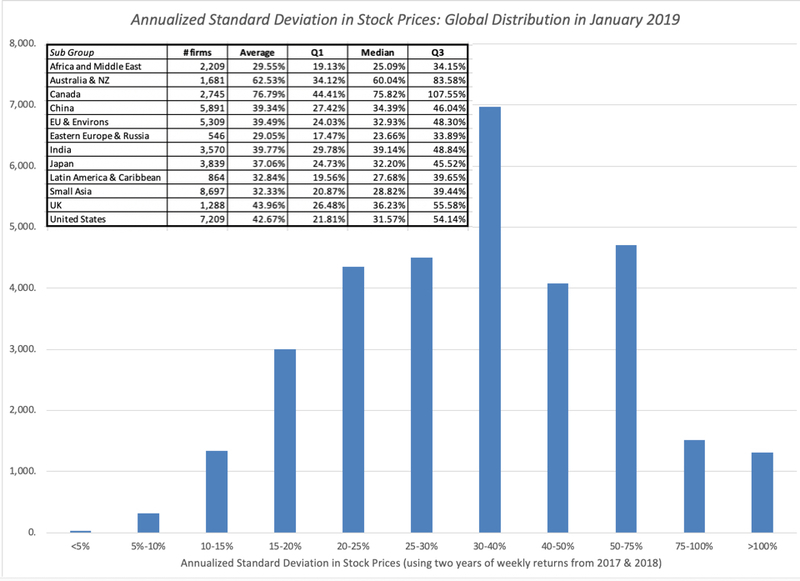 I use 2-year weekly standard deviations for all firms in my sample, using the time period available for companies that have listed less than 2 years, and the distribution of annualized standard deviations is in the graph below. As with the HiLo risk measure, and for the same reasons, the US, Canada and Australia look riskier than most emerging markets. Again, I report on the regional differences in the table embedded in the graph, with country-level statistics available at this link. It is Statistics 101! After all, when presented with raw data, one of the first measures that we compute to detect how much spread there is in the data is the standard deviation. Furthermore, the standard deviation can be computed for returns in any asset class, thus allowing us to compare it across stocks, high yield bonds, corporate bonds, real estate or crypto currencies. To the extent that we can also compute historical returns on these same assets, it allows us to relate those returns to the standard deviations and compute the payoff to taking risk in the form of Sharpe ratios or information ratios. That said, the flaws in using just standard deviation as a measure of risk in investing have been pointed out by legions of practitioners and researchers. Not Normal: The only statistical distribution which is completely characterized by the expected return and standard deviation is a normal distribution, and very little in the investment world is normally distributed. To the extent that investment return distributions are skewed (often with long positive tails and sometimes with long negative tails) and have fat tails, there is information in the other moments in the distribution that is relevant to investors. Upside versus Downside Variance: One of the intuitive stumbling blocks that investors have with standard deviation is that it will higher if you have outsized returns, whether they are higher or lower than the average. Since we tend to think of downside movements as risk, not upside, the fact that stocks that have moved up strongly and dropped precipitously can both have high standard deviations makes some investors queasy about using them as measures of risk. Liquidity effects: As with the high low risk measure, liquidity plays a role in how volatile a stock is, with more liquid stocks being characterized with higher standard deviations in stock prices than less liquid ones. Total Risk, rather than risk added to a portfolio: The standard deviation in stock prices measures the total risk in a stock, rather than how much risk it adds to a portfolio, which may make it a poor measure of risk for diversified investors. Put differently, adding a very risky stock, with a high standard deviation, to a portfolio may not add much risk to the portfolio if it does not move with the rest of the investments in the portfolio. In summary, the combination of richer pricing data and access to statistical tools has made it easier than ever to compute standard deviation in prices, but using it as your sole measure of risk can lead you to make bad investment decisions. 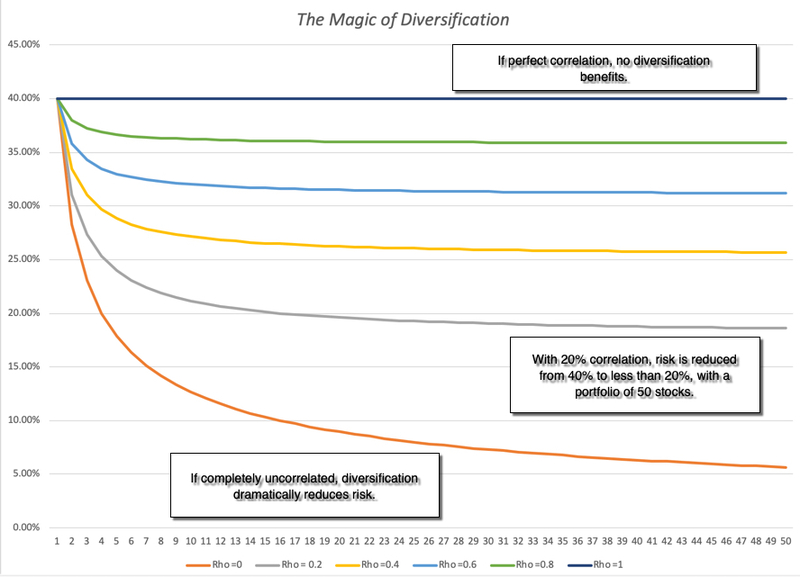 In the graph on the effect of diversification on portfolio risk, I noted that the key variable that determines how much benefit there is to adding a stock to portfolio is its correlation with the rest of the portfolio, with higher and more positive correlations associated with less diversification benefit. Building on that theme, you can measure the risk added by an investment to a diversified portfolio by looking at how it moves in relation to the rest of the portfolio with its covariance, a measure that incorporates both the volatility in the investment and its correlation with the portfolio. This equation for added risk holds only if the investment added is a small proportion of the diversified portfolio, but if that is the case, you can have a risky investment (with a high standard deviation) that adds very little risk to a portfolio, if the correlation is low enough. If you are willing to add on whole layers of assumptions about no transactions costs, well functioning markets and complete information, the diversified portfolio that we will all hold will include every traded asset, in proportion to its market value, the capital asset pricing model will unfold and the betas for investments will be computed against this market portfolio. Note though, that even if you are unwilling to go the distance and accept the assumptions of the CAPM, the covariance and correlation remain measures of the risk added by an investment to a portfolio. Unlike the high low risk measure and the standard deviation, where my estimation choices were limited to time period and return interval, the correlation coefficient is also a function of the index or market that is used to compute it. That said, the distribution yields some interesting numbers that you can use, even as a non-believer in the CAPM. The median correlation for a US stock with the market is about 20%, and if you check the graph for savings, that would imply that having a portfolio of ten, twenty or thirty stocks yield substantial benefits. As you move to emerging markets, where the correlations are even lower, especially if you are a global investor, the benefits become even larger. Again, if you want to see this statistic on a country-by-country basis, try this link. If you have bought into the benefits of diversification and have your wealth spread out across multiple investments, there is a strong argument to be made that you should be looking at covariance-based measures of risk, when investing. If you use a beta or betas to measure risk in an investment, you get an added bonus, since the number is self standing and gives you all the information you need to make judgments about relative risk. A beta higher (lower) than one is a stock that is riskier (safer) than average, but only if you define risk as risk added to a portfolio. I use covariance based measures of risk in valuation but I recognize that these measures come with limitations. In addition to all of the caveats that we noted about liquidity's effect on price based measures, the most critical ingredient into covariance is the correlation coefficient and that statistic is both unstable and varies over time. Thus, the covariance (and beta) of the stock of a company that is going through a merger or is in distress will often decrease, since the stock price will move for reasons unrelated to the market. As a result, the covariance measures (and this includes the beta) have substantial estimation error in them, which is one reason that I have long argued against using the beta that you get for one company with one pass of history (a regression beta) in financial analysis. What can you do instead? Since covariance and beta are measures of risk added to a portfolio, they should be more reflective of the businesses (or industries) a company operates in than of company-specific characteristics. Using an industry average beta for steel companies, when valuing US Steel or Nucor, or an industry average beta for software companies, when valuing Adobe, is more prudent than using the regression betas for any of these companies. I will build on this theme in my next post. For many value investors, the biggest problem with using standard deviations or betas is that they come from stock prices. So what? In the value world, it is not markets that should drive our perception of risk, but the fundamentals of the company. Thus, using a price based risk measure when doing intrinsic value is viewed as inconsistent. In this section, I will look at proxies for risk that are built upon a company's performance over time. Not surprisingly, in every part of the world, the percentage of firms that have positive EBITDA exceeds the percentage with positive operating income or positive net income. Looking across regions, Japan has the highest percentage of money making firms, with 88.80% making positive net income, and Canada and Australia, with their preponderance of natural resource companies, have the highest percentage of money losers. There are some surprises here. 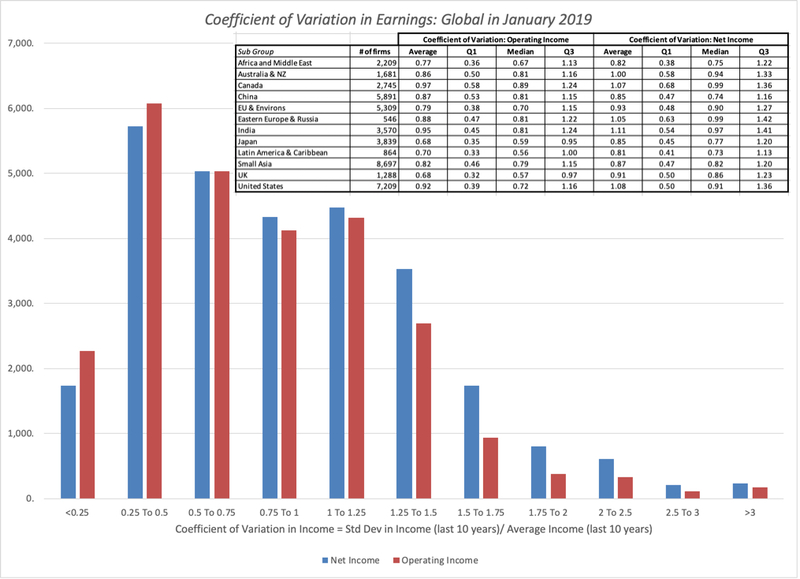 While Australia and Canada again score near the top of the risk table, with the highest variation in earnings, Latin American companies have the lowest volatility in operating and net income, if you compare medians. You can take this to mean that Latin American companies are not risky or that there are perils to trusting accountants to measure performance. Finally, the country level risk statistics are available at this link. While I sympathize with the argument that value investors pose, i.e., that using price based risk measures in intrinsic valuation is inconsistent, I am very quickly brought back to earth by the recognition that computing risk from accounting earnings or financial statements comes with its own limitations, which in my view, quickly overwhelm its benefits. The accounting tendency to smooth things out shows up in earnings streams and if you add to that how the numerous discretionary accounting plays (from how to account for acquisitions to how to measure inventory) play out in stated earnings, I am not sure that I learn much about risk from looking at a time series of accounting earnings. You may find that there are other items in accounting statements that are less susceptible to accounting choices, such as revenues or cash flows, but, for the moment, I remain unconvinced that any of these beat price-based measures of risk. The vast majority of investors never attach risk measures to stocks, choosing instead to proxies or stand-ins for risk. Thus, tech stocks are viewed as riskier than non-tech stocks, small cap stocks are perceived as more risky than large cap stocks and, in some value investing circles, stocks that trade at low PE ratios or have high dividend yields are viewed as safer than stocks with high PE ratios or do not pay dividends. 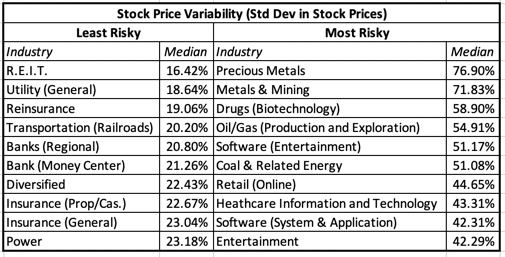 In this section, I look at how the measures of risk that I have computed from price and accounting data correlate with these proxies. The market capitalization correlates remarkably well with measures of both price and earnings risk, with smaller companies exposed to far more risk than larger firms. 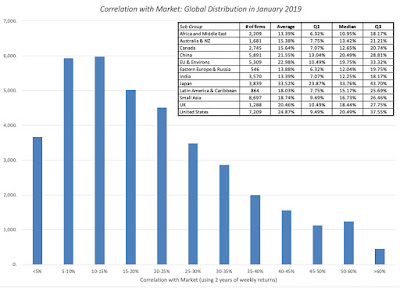 The note of caution, though, comes in the correlation numbers, where the smallest companies have the lowest correlation with the market, suggesting that much of the added risk in these companies can be diversified away. Put simply, if you want to own only three or four stocks in your portfolio, it is perfectly appropriate to think of small companies as riskier than large ones, but if you choose to be diversified, company size may no longer be a good proxy for the risk added to your portfolio. With both groups, we notice an interesting pattern. While there is no clear link between how low or high a stock's PE ratio is and its risk measures, money losing companies (where PE ratios are not computed or are not meaningful) are riskier than the rest of the market. Similarly, with dividend yields the link between dividend yields and risk measures is weak, but non-dividend paying companies are riskier than the rest of the market. There is significant overlap between the two measures, with the same industries, for the most part, showing up on both lists. The caveat I would add is that some of these sectors have thousands of companies in them, and that there are wide differences in risk across these companies. This has become a far longer post than I intended and I want to wrap it up with three suggestions, when it comes to risk. Disagree with models but don't abandon first principles: Finance, in both theory and practice, is full of models for and measures of risk. Since these models/measures are built on assumptions, some of which you may disagree with vehemently, you may find yourself unwilling to use them in your investing. That is not only understandable, but healthy, but please do not throw the baby out with the bathwater and abandon first principles. Thus, refusing to use betas to estimate discount rates is okay but leaping to the conclusion that risk should not be considered in investing is absurd. Pick the risk measure that is right for you: We are lucky enough to be able to estimate or access different risk measures, price or earnings based, for companies that we might be interested in investing in. Rather than lecturing you on what I think is the best measure of risk, I would recommend that you look inwards, because you have to find a risk measure that works for you, not for me. Thus, if you are a value investor who buys companies for the long term, because you like their businesses, and you trust accountants, an earnings-based risk measure may appeal to you. In contrast, if you are more of a trader, buying stocks on the expectation that you can sell to someone else at a higher price, a price-based risk measure will fit you better. With both price and earnings measures, the question of whether you want to use individual company risk or risk added to a portfolio will depend upon whether you have a concentrated or diversified portfolio. Finally, the different risk measures that I have listed in this section often move together, as can be seen in this correlation matrix. Thus, while you may use market capitalization as your risk measure and I might use beta, our risk rankings may not be very different. In closing, whatever risk measure you pick to assess investments, I hope that you earn returns that justify the risk taking! Hi Aswath. Your posts are excellent and extremely informative. I've noticed, however, that you are sometimes apologetic. For example, from Jan. 21 post, "knowing fully well that I will be saying things about risk that you strongly disagree with, but it is worth the debate." Some readers (especially those on Seeking Alpha) will disagree with anything you say. Don't worry about them. Just do what you do. You do it very well. Thanks.